For our second Beyond Bums featured product, I was very excited to receive a product from Wee Little Changes. This dainty online shop carries so many amazing products that are great for your baby, the environment, as well as your wallet! April, who runs the online shop with the help and support of her family, is a stay at home mom from Wilmington, North Carolina. April takes great pride in the products that she stocks, sells, and showcases, and she and her family have personally tested everything that is on sale to ensure that it meets their standards for high quality items! And I was shocked when I discovered this little boutique to see just exactly how much they do carry! They have cloth diapers and accessories galore--from contours to Indian prefolds to bumGenius or wool soakers--they have economy picks and designer picks alike! Another popular diaper feature that they have is a Newborn diaper rental/"Try it!" program, where you can use or try diapers for a set period of time while you really get your bearings with diapering your new baby. In fact, this package option is so popular that April will soon be adding even more packages to select from in terms of the rental and 'try it' programs! But, seeing as this is the Beyond Bums event, I'm happy to also let you know that apart from all her hordes of diapers, April also has a wonderfully well stocked shop chock full of bathtime items, teething needs, eating tools, bibs, burp cloths, bottles, newborn essentials, blankets, special gift items, and the list goes on and on and on! It's a great perk to be able to pick up so many shopping items in one spot, especially when April offers free shipping to the USA at all times, as well as giving special discounts for military families. 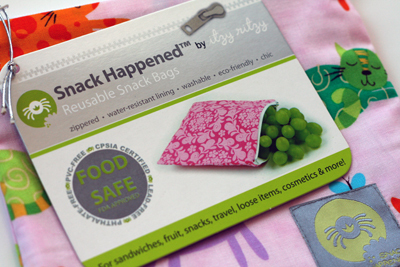 Up for review, April sent me a "Snack Happened" reusable snack bag by Itzy Ritzy. I was very excited to receive this in the mail as I already have a "Wet Happened" wet bag by Itzy Ritzy (I got it as a gift several months ago) and am a big fan! The wet bag never leaks, so I was confident that the snack bag would also be made with a terrific, leak-proof construction! Going green has been a slow and steady process for our family, and one area that we've been making continuous growth in is in regards to packing lunches for work. Over the years, we've moved from single serving drink containers to reusable bottles; from unhealthy plastic microwave dishes to safer glass alternatives; and from disposable cutlery to metal cutlery. One area that we still had to improve on, however, was in our use of plastic Ziploc bags. We often go to work with a handful of pretzels, a few cookies, or some grapes or cherry tomatoes. Inevitably all these sorts of loose items end up in a Ziploc that gets chucked on the other end. Because many workplaces and public places also don't have the proper recycling bins handy, a lot of plastic bypasses the recycling center and ends up straight at the landfill. I've used a flap style reusable bag for about a year now, but I only use it for dry items as it's not completely sealed and would definitely leak. This Itzy Ritzy snack bag is zippered shut and, like I mentioned, is the same construction as their wet bags to ensure that your sliced tomatoes and cucumbers don't leak all over your lunch sack! I was also very happy to see when it arrived that all the materials used in this bag are FDA Food Safe approved. At times, I've seen homemade snack bags made with a variety of materials, some of which have not yet been tested for use with food. I definitely do not want to end up eating laminated plastics in my lunchtime snack! This bag is certified free of all BPA, lead, and phthalates. The inside liner is a thick sturdy layer of PVC-free waterproof fabric, and the outside is decorated with a variety of cute, 100% cotton prints. I also love that this snack bag can easily be washed by hand (just wipe it out over the sink with a clean, soapy rag or sponge) OR in your washing machine. Just like a wet bag, for best results, just hang or prop it up to dry gently as it will preserve the fabrics and zipper better. 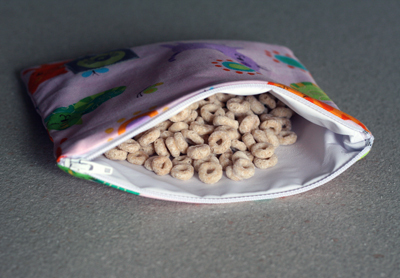 This 7"x7" snack bag is a generously sized bag that could easily accomodate a large sandwich. It's also perfect for loose snacks like veggie sticks, chips, pretzels, trail mix, cookies, or loose cereal! 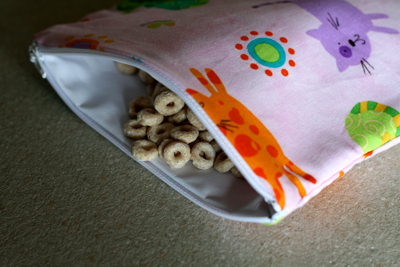 As an alternate use, I also thought this snack bag would make a fabulous cloth wipes case for your diaper bag, especially if you're like me and hate the hard-shelled plastic kind because of their lack of flexibility. I'd love to place clean (dampened or dry) wipes in here for use on day trips out of the house. I love that if used this way, it could easily fit in any side pocket or even be folded down into a corner of your purse and bag (unlike the hard wipes cases). Overall, for $9.95, this little reusable bag is a steal of a deal, especially considering just how many plastic baggies it will keep out of the landfill in its lifetime! With it being so versatile, you really could use it for anything from baby wipes, to food and snacks, to cosmetics, to an organizing pouch for small crayons or toys, or anything else! BUY IT: Visit Wee Little Changes to pick out your very own Snack Happened™ Reusable & Washable Snack Bags by Itzy Ritzy for just $9.95! I love cloth products since they are Eco-friendly. Thank you very much.